Minerals can be obtained either from destroying planets of from conducting [[Planetary Research|'''Planetary research''']]. Planetary research involves gathering soil samples. If the player has used up all the chances for gathering soil samples and hasn't found the Mineral through destroying the planet, he can reattempt to find the Mineral on the same planet after entering a [[Black Hole]] or look for the mineral on other planets. Each Mineral has a different '''base drop chance''', which increases as the player sends more [[Resources#Scientists|Scientists]] to the current planet. For each additional Scientist that is stationed on the planet, the chance is increased by 10% of its initial value. 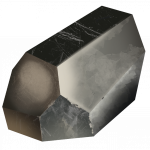 Each Mineral has a different '''base drop chance''', which increases as the player sends more [[Scientists|Scientists]] to the current planet. For each additional Scientist that is stationed on the planet, the chance is increased by 10% of its initial value. The bonus from [[Scientists]] can be increased via [[Boring Experts]]. This effect is never reset and each new Mineral multiplies the corresponding bonus to [[Resources#Bacteria|Bacteria]] production. The extra [[BPS]] from Minerals does not increase [[BPC]] even if the player has an [[BPS Conversion#Upgrades Adding Bacteria from BPS to BPC| upgrade that adds Bacteria from BPS to BPC]]. Each Mineral has a different base drop chance, which increases as the player sends more Scientists to the current planet. For each additional Scientist that is stationed on the planet, the chance is increased by 10% of its initial value. The bonus from Scientists can be increased via Boring Experts. The extra BPS from Minerals does not increase BPC even if the player has an upgrade that adds Bacteria from BPS to BPC. This page was last edited on 6 June 2018, at 11:42.